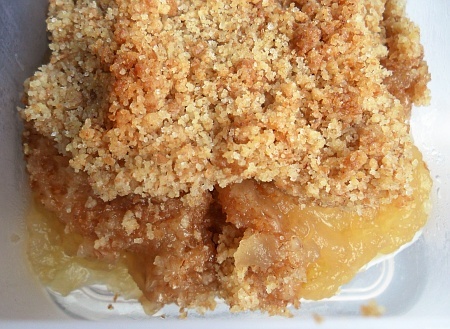 This recipe will provide you with a good starting point for your making own crumbles - the crumble mixture is not too sweet and neither is the filling. When you have made them a couple of times and got a feel for what is going on, you can experiment with the quantities of sugar, types of flour and so on, you might want to use more fruit to make more filling - see the variations at the bottom of the page. the sugar and the 'secret' ingredient. 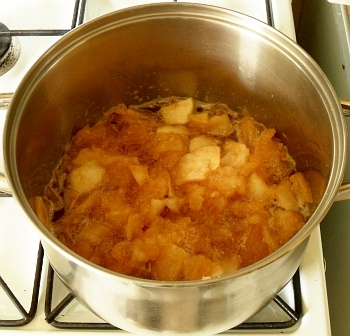 In a large cooking pot, put the cored, skinned, sliced apples, along with the sugar. Next, add two teaspoons of pomegranate molasses - this is not enough to be able to identify the flavour in the final filling but it will give it an edge, that unknown flavour that makes it a bit different to just plain old apple crumble. If you can't get pomegranate molasses, then you might find that Grenadine will do. However, you can't really substitute it one for one - it is only 3 per cent pomegranate juice (not molasses) so you will have to use substantially more and you might want to consider losing some of the granulated sugar in the recipe to compensate for that added to the Grenadine. Remember that pomegranate molasses is nothing but boiled-down pomegranate juice - no added sugar. Once cooked, it should look like this. Put a gentle heat under the pan to start it cooking. 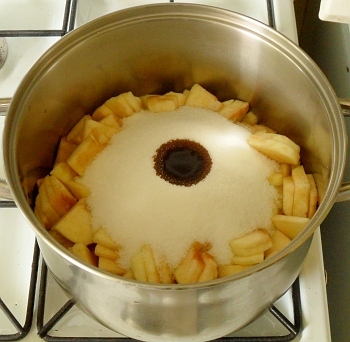 If you are concerned about the apple on the bottom burning, you can add a teaspoon or two of water. However, there should be enough liquid in the bottom to get it started without doing that. Put the lid on to keep the steam in and keep an eye on it whilst it gets going. Soon, the steam will condense on the sugar and dissolve it, allowing it to run down into the bottom. 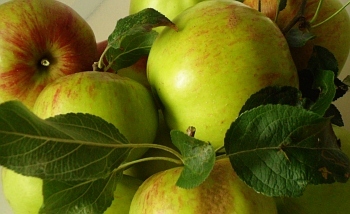 After a while, most of the apple will become translucent, at which point it is cooked enough. When this is in the dish, it needs to steam the crumble mixture so you need to make sure that you don't boil away too much water - experience of making this dish will tell you when that is. So, if you think it is getting too low, just add a little water - maybe 100mls at the most. Turn off the heat and leave it covered. 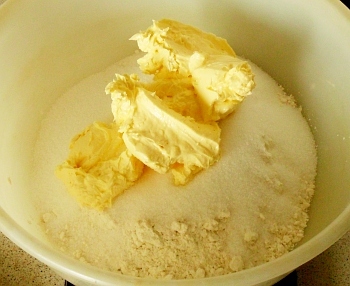 Next, put the flour, sugar and margarine in a mixing bowl. Cover the margarine in flour/sugar and use a fork to mash it up and disperse it evenly throughout the mixture. Once the largest piece of margarine is roughly 1cm across, wipe the fork clean and use your hand to mix it - holding your fingers fixed as though you were gripping a large grapefruit and moving your whole hand in a circular fashion, like a food mixer (don't use a food mixer though, it is too rough on this, use your hand). 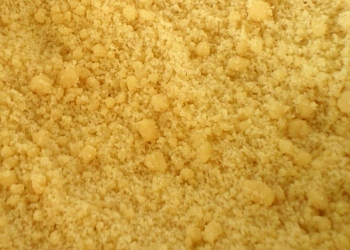 crumble mixture should look like. After a fairly short while, the mixture should be fairly fine and even. You should be able to get a handful of crumble mixture, squeeze it and it retain the shape of your hand. Do this with all of the mixture so as to even out the fat content of the mixture. Once you have done that, break it up into the fine mixture you can see at roughly life-size in the photograph on the right. of A4 paper, spread out the apple filling. This recipe is sized for a ceramic dish that is roughly 5cm deep by 20cm x 30cm (it leaves roughly 1cm at the top so that is a total of 4x30x20 = 2.4 litres). You can either give some to other people or, just make a half quantity in a smaller dish. Spread the filling evenly in the bottom of the dish. a little at a time, to make sure it is even. Next, a little bit at a time, spread the crumble mixture on top. If you put too much on in one go, you can end up pushing the filling out of the way and making it uneven so just a little bit at a time, making sure that you spread it out to the edges and the corners. 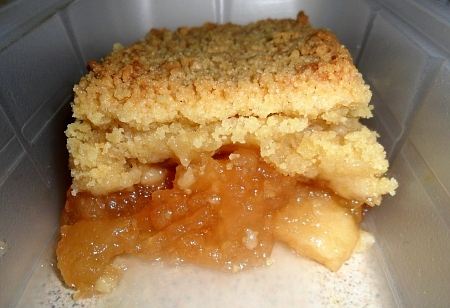 One thing that you will notice with the crumble once it has been cooked is that the top can be quite hard - it is quite thick. 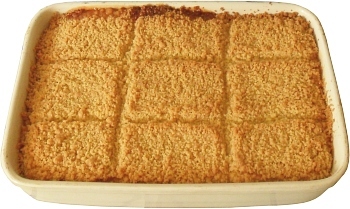 In order to help you not to have too much on any particular day - it is easy to help yourself to progressively larger portions as the week goes on - just use a knife to make little furrows in the crumble so that it will tend to fracture along those lines when you are cutting up the cooked meal. has 90 grammes of sugar in it. Next, bake it in the middle of an oven at gas mark 6 (200C) for between 35 and 45 minutes. Check it to make sure that it is not burning and if it looks as though it is browning more along one edge, turn it around, half way through the cooking time in order to even it out. Tempting though it is, DO NOT EAT THIS FRESH FROM THE OVEN - you will burn your mouth. 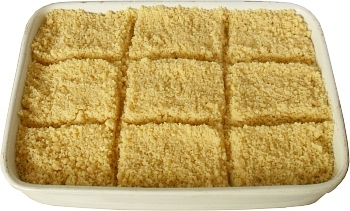 The filling contains a lot of sugar which retains heat and takes a long time to cool down. When it has largely cooled down, you can use a sharp knife to break it up and separate it from the dish. Finally, put a portion into a small lunch box and as a bonus, you can take a small pot of custard along with it to work. you need, half way through the shift. A little pot of custard? half a teasponn of cardamom powder added. Fruit - instead of apples (or as well as), you can use any fruit that you have at hand, even soaking dried apricots if you want. If your local hedgerows are bursting with fruit and you have the legal right to do so, you can use what you pick. Also, you don't need to use 1kg of fruit - you can stretch this recipe to 1.5kg without much problem. 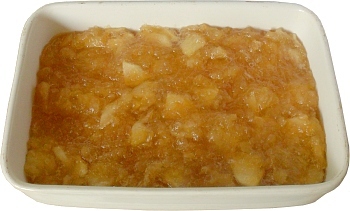 Sugar in the filling - you can add no sugar at all to the filling to make it really tart, or, if you want to make it like an American Apple Pie filling, you can add the same weight as the fruit you use (they might even use more than that but don't go there, you will be dicing with diabetes). Additional flavouring - here, we have pomegranate molasses but instead, you can use virtually anything you like - sultanas or cinnamon for example. To the crumble topping, you can add half a teaspoon of cardamom powder. Type - here we use plain white flour but wholemeal flour makes a very good crumble, and logically, if you haven't got enough of one of them, a mixture will do nicely. Plain - again, we are not making it rise so plain flour will work just as well as self-raising flour. Self-raising flour has salts added to it to make it rise so if you are going to use that instead of plain, you might want to add a little extra sugar. Sugar in the topping - here we use 300g but you can use 400g if you want it sweeter, without taking it too far. Margarine - I use vegan margarine but I am vegan. You can use butter or any other 'spread it on bread to make sandwiches' type of fat. If you are making this for someone who is sensitive to dairy products then this is the only potential source of dairy in the recipe so, in that case, go for a vegan margarine.